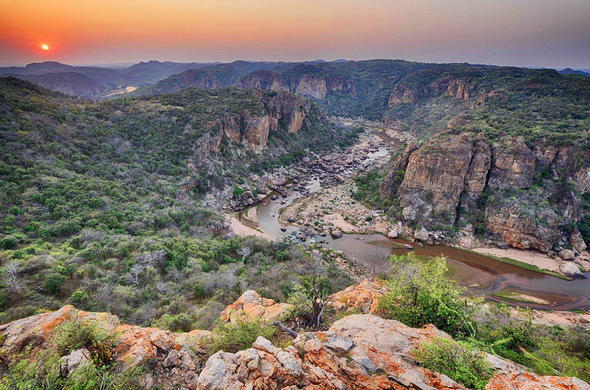 A land of incredible beauty made up if expansive bushveld filled with African wildlife and wonderful culture and history, Limpopo is located in the top right of South Africa and is the province that forms the border between Botswana, Zimbabwe and Mozambique. One of South Africa's 9 provinces, Limpopo spans across 125 754 km2 (48 554 square miles) and is located in the top right of South Africa. Home to nearly 5.5 million people, Limpopo is the location of almost half of the massive Kruger National Park, South Africa's largest game reserve and one of the most popular tourist attractions in the country.Named after the mighty Limpopo River that forms the border between South Africa, Zimbabwe and Bostwana, Limpopo means 'waterfalls' in Zulu and some other African languages including Nguni. Limpopo's capital city; Polokwane is located virtually in the middle of the province.The region boasts one of the most varied cultural, geological, archaeological and natural systems in the world and has a long history that dates back for many many centuries to a time when the San people lived in the area.Now a peaceful and thriving region with major importance for South Africa for business connections, the history of the Limpopo region tells a story of a turbulent past with bloody battles and violent clashes that have resulted in a number of fascinating monuments and museums that stand as testament to the past. Many of the past's storied as still being unearthed and there are many myths and legends surrounding the events that once occurred in the area. Once known as Mapungubwe, Limpopo was once a major trading area for the Chinese, Arabs and Indians who came down the coast to trade with the people of the great Mapungubwe kingdom, exchanging gold and ivory forbeads and ceramics.Over time the rich kings of the Mapungbwe area moved up into Zimbabwe to form what became known as Great Zimbabwe. Today visitors can return to the Mapungubwe site to visit one of South Africa's 7 World Heritage Sites and view the place where historical artefacts including the famous 'golden rhino' were found. Later, the Venda, Pedi and the Shangaan people moved into the area and the arrival of the Afrikaans Voortrekkers saw more violent battles as the different cultures and people tried to lay claim to the land. Limpopo also contains most of the Waterberg Biosphere that stretches across over 15 000km2 (5 800 square miles) of the province. The Waterberg Biosphere is a mountainous massif (piece of the earth's crust that is recognised due to the number of faults and flexures) where a large number of important archeological finds have been made dating back to the Stone Age. A number of the historical finds that have been found here have been pivotal in the understanding of the origin of humans. A sacred location for the vhaVenda people, Lake Fundudzi is found in the mountainous northern regions of the province. Rich in cultural significance, the Venda people believe that the large body of water is enchanted and is home to a mythical python and a white crocodile. The white crocodile is said to be there to guard the ancestors that live in the water and the Venda people believe that the fullness and colour of the lake indicates the mood or temperament of the ancestors.One of the few natural lakes in the whole of South Africa, scientists believe the lake was formed many years ago by a large landslide, but the local people believe the water exists there due to something otherworldly as there are 3 rivers that flow into the lake and yet the lake never overflows despite there being no outlet for the water. ThatheVondo Forest is the large forest that surrounds Lake Fundudzi. The forest is believed to be so full of the spirits of the Venda people that few or no Venda people will venture into it for fear of facing the wrath of the mythical White Lion and the thunder and lightning bird, called Ndadzi, that are believed to guard the area. It is said that Ndadzi flies on the wings of thunder, flashing lightning from its eyes and that rain falls from its beak and if the bird of thunder and lightning drops an egg at the foot of a tree then that tree will be burnt and destroyed by fire.Today visitors can take tours, hosted by the local people, to the different sites, to learn about the myths and legends that exist here.